Federation Commander (FC) is a tactical space combat board and miniatures game by Amarillo Design Bureau (ADB). The game has been out a couple of years now but we have only recently played it. FC is essentially a lighter version of the venerable Star Fleet Battles (SFB) game that has been around, in various incarnations, since the late 1980s. While we played a lot of SFB in the old days it got far too complicated over time and we stopped playing. We obviously were not the only ones and thus ADB designed Federation Commander. 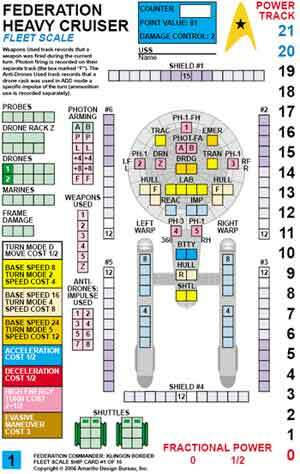 Federation Commander, as does SFB, takes place in the world of the original Star Trek series because it is based off of a license from the Franz Joseph Starfleet Technical Manual. As a result, you will not find any of the movie or later Trek series stuff here. But it does not really matter because ADB has fleshed out plenty from the original era and has even written their own official Star Trek time line. The game comes in two core products, either FC: Klingon Border or FC: Romulan Border. Both sets have all you need to get started and include the same rules but let you pick which ‘front’ you want to fight on and give you just those appropriate ship cards. You can always add the others later with the Booster Packs if you wish. There are expansions on both sets including Klingon Attack, Romulan Attack, Tholian Attack, and Battleships Attack. Moreover, there are add-on Booster Packs as well that add more ship cards. If all of that is not enough ADB also has their own line of miniatures for use with FC. The two core sets give you the rules, full-color laminated charts and ship cards, 1/2″ and full-color 1″ counters, and mounted map boards. The boards include 1/2″ hexes on one side and 1″ hexes on the other. The larger hexes are for the 1″ counters or for use with miniatures. The rulebook has a nice layout and is well organized but is only in black and white. The various expansions add a few more rules and provide more map boards, ship cards, and counters. The Boosters only provide more laminated ship cards. The gameplay is much like SFB was in the early days. A turn is divided into eight impulses and each impulse is divided into four movement sub-pulses. Movement and most combat take place during the various sub-pulses. The game cards provide a nicely broken-out sequence of play that makes it easy to follow. Basically you start a turn by picking a speed and paying for its energy cost — The game is in essence a game of energy management and maneuver — then you start movement and combat. All of the various Star Trek weapons are available including Phasers, Disrupters, Photon Torpedoes, Plasma Torpedoes and even some you may not have heard of including drones (guided missiles) and suicide shuttles (shuttles packed with warheads) plus a whole lot more. The weapons all have various characteristics as well as specific firing arcs depending on their mounting on a particular ship. They also take a certain amount of energy to fire. Your ship only has so much energy generated by its engines, reactors, and batteries thus you may not be able to fly as fast as you want and fire everything you want every turn. This is where the tactics come into play. Balancing your energy use with the maneuvers of your ship to achieve the best firing angle on your enemy while presenting the worst for your enemy is what the game is all about. It is a game that rewards careful play, knowledge of one’s ship, and proper tactics. In essence, the game is sort of a mix of World War I air combat and modern naval warfare. The game has two scales, Fleet and Squadron. In Fleet scale the ship cards have less detail (and less energy) and thus a particular scenario will either play faster (less choices and ships die faster) or you can play a scenario with more ships more easily. Squadron scale uses the fully detailed ship cards but both scales use the same rules and the ship cards have the Fleet scale ship on one side and the Squadron scale ship on the other. Thus Squadron scale plays a bit slower and/or uses fewer ships. The two scales are a nice option overall and allows players to choose the type and size of scenario they wish to play. FC is a very fun and addictive game to play. It is not hard to learn and you can skip a lot of rules, such as High Energy Turns and Drones, when you are starting out to further streamline play. You can play one-on-one ship duels or larger fleet engagements with a dozen ships on each side. There are rules for planets and other ‘terrain’ as well as starbases and transports. There are even rules for gathering intelligence using the science stations on a ship that allow for scenarios based around gathering info on an enemy ship or even a monster! FC also includes rules for more esoteric items such as boarding parties and tractor beams. But, unlike SFB, the rules are very tight and give you enough for more tactical options and flavor without dipping into boring, complicated minutia. FC is a well supported game with tactics, fiction, and other new stuff in the print magazine Captain’s Log and ADB also has a dedicated FedCom forum. Captain’s Log #32 debuted Federation Commander, and has an excellent example of play, and all subsequent issues have FC content. Perhaps the best resource is ADB’s free monthly FC pdf newsletter Communique. You will need to register at The Commanders Circle to get it but all of the back issues are available. If you like starship combat games and/or Star Trek and would like a game with a bit more detail than games such as Full Thrust or B5:A Call to Arms then check out Federation Commander. ADB makes it easy to see for yourself with their free introductory rules pack First Missions. Highly recommended. ADB also produces the Starline 2400 line of miniatures for use with Federation Commander. These are mostly pewter (with a few plastic) starship miniatures around two to three inches long on average. The quality of the miniatures ranges from outstanding for the plastic Federation ships to barely acceptable for some of the other castings. Ships for all the races in the game (as well as some yet to come) are available. You can use the miniatures directly on the large board hexes or forgo the hexes and use free form movement with turn gauges and rules already provided in the game. Because FC scenarios generally have fairly low ship counts it is an easy game for which to acquire miniatures and they really add visual appeal to the game. Unrelated, directly, to FC is a card game set in the same world of Star Trek, Star Fleet Battle Force. SF:BF is a fast playing game of starship combat and includes much of the flavor of Federation Commander. A game can be played in less than two hours and can easily handle up to five players (technically up to six can play). The game has you moving ships between your screen, main body, and reserves, and balancing the play of weapon cards to destroy your enemy with defensive measures to ward off, or weaken, enemy strikes. It is a fast, fun game and the components are attractive and of good quality. Note: Captain’s Log #23 has cards (well a page you can photocopy) and rules for planets. Subsequent issues have the occasional new playtest rule or card for SF:BF. Issue #32 has cards and rules for scouts. You can also download these off the ADB Play Aids page. This entry was posted in Board Wargames, Federation Commander, Miniature Wargames, Reviews, Sci-Fi.